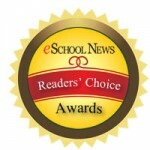 We're thrilled to have been selected by eSchool News as one of the Fifty Best Ed Tech Products for Schools in their 2012-2013 Readers' Choice Awards! The award, which "recognize[s] the educational technology products and services that have had the greatest impact in readers' schools" is the result of nominations from real teachers and ed tech leaders - like you - who took the time to write in and describe their success with ubermix. Congratulations to every member of the ubermix community who has participated in making ubermix better and brought powerful, proven, free software to students around the world!